Slippery Salmond – would you trust this man? I came across this video today and it’s not only informative but also pretty humour too. 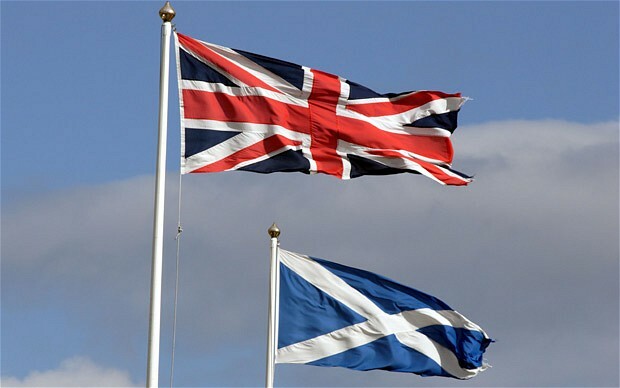 I cannot not vote in the Scotland referendum to break with the United Kingdom but if I could vote…I’d vote no. This referendum is merely a vanity project and it is a shame that so much money is being spent on it at a time when real and substantial cuts are being made to public finance. So, why I think we should NOT have an independent Scotland? 1) The country can barely manage to muster an international football team – what hope of an army and navy? 3) Who will pay for Scotland’s healthcare? The 2011 Census showed that the number of people aged 65 and over was higher than the number aged under 15. The number of over-65s has increased by 85,000 (11%) since 2001, and now represents some 17% of the total population. There were 230,000 people aged 80 and over in 2011, an increase of 19% on the figure of 193,000 in 2001. 4) Who will pay for Scotland’s pensions? If you think the cost of the NHS is bad – just wait until they have to fund their own pensioners! 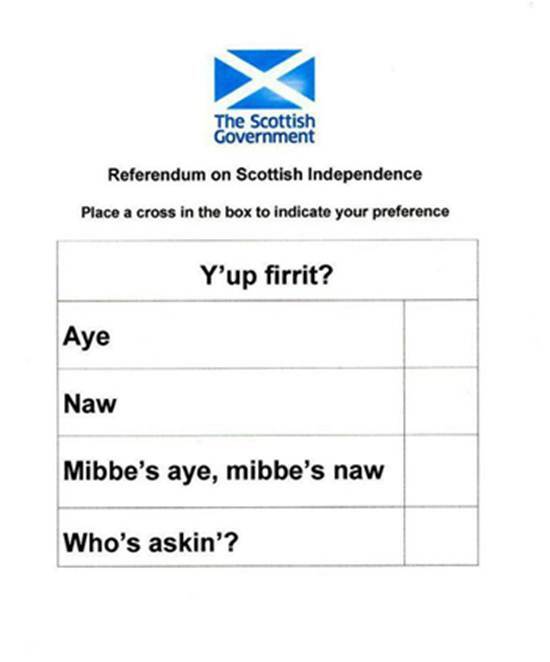 6) What currency will Scotland choose? As can be seen from the video – at first, Alex Salmond wanted to get rid of the Sterling shackles and opt for the Euro currency. NOW, that the Euro is in meltdown – he wants to stay with England’s currency….hardly a credible response. In a speech in Edinburgh George Osborne has said that England will NOT share the pound with Scotland. Anyway, some argue that a reliance on Sterling would likely consign Scotland to an even weaker position that it has today. “No currency and you simply become a colony of the Bank of England”. 9) Could it join the EU? Not according to the President of the European Commission Jose Manuel Barroso who said it would be “extremely difficult, if not impossible” to get the agreement of all existing EU members in order to become a new state. 10) “Scotland would be better off alone”…that is according to Alex Salmond who I honestly believe has set about on this vanity project which is more about trying to get his name scribbled into a history book – than it has to do with what is best for Scotland and it’s people. Already he has used what I would see as anti-English sentiments claiming ‘People do become sick and tired of the succession of day-tripping Conservative ministers flying up to Scotland to deliver lectures and then flying back to Westminster again’. Why shouldn’t George Osborne deliver a lecture in Edinburgh? It’s ONE country! Worst of all the crap that comes out of Alex Salmond’s mouth is the drip dripping of anti-English sentiments. It is a sure sign that he doesn’t think he win the vote purely on the basis of facts – so, he’s going to try and get people’s “yes” vote by anti-English racism. There is already evidence that racism is on the rise in Scotland.